Get best value with a two-hour dinner cruise topped by roving views of Sydney Harbour! Start your cruise time in the air-conditioned dining deck and enjoy roving views of the harbour and its attractions from panoramic windows. Enjoy dinner and drinks at leisure as the buffet is open and regularly replenished for 90 minutes. Once done, stroll the large outer decks for uninterrupted views of the illuminated Sydney night sky. With such great inclusions and an all-inclusive package, this cruise is the perfect solution for a night out on the harbour or some fun family time! 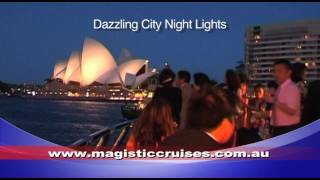 So why wait, book your Sydney Harbour dinner cruise today!